How do lawyers transfer their knowledge? Lawyering scholars have been talking about “tacit knowledge” since the early 1990s. A recent ABA publication encouraged law students to use their externships and other practical experiences to interact with lawyers and try to glean some of that tacit knowledge via “extensive personal contact, regular interaction, and trust.” I touched on tacit knowledge in an early-summer blog post encouraging summer associates to talk with experienced lawyers about their work and to closely observe their nonverbal signals during these conversations. This advice suggested perhaps the slightest hint of the idea that there might be dissonance in what lawyers say they do and what they actually do. An article by one of my law-professor heroes, Richard Neumann, Jr. explores this concept in depth. The article is Donald Schön, The Reflective Practitioner, and the Comparative Failures of Legal Education, 6 Clinical L. Rev. 401 (2000). 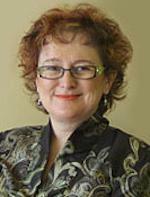 It attacks superficial notions of lawyering and legal education at multiple levels. What is the difference between what lawyers say they do and what they actually do? The real tacit knowledge is in what they actually do—which they may not be willing to describe or even fully aware of. This insight is from the work of Donald Schön, a now-deceased professor of architecture at MIT. Schon’s ideas and Neumann’s exploration of them aren’t new, but the insights remain relevant and helpful. [T]acit knowledge is not necessarily accurate knowledge. Because it is tacit, it is also unexamined. The tacit ‘knowledge’ of an ineffective professional might be nothing more than superstition—and correspondingly dangerous to clients. A “theory of action” is how a person describes the work they do. A “theory-in-use” is what actually governs the person’s actions. I’ve thought about this concept with legal writing, and writing generally. It’s much easier to change one’s nominal theory of action, especially if that means adopting new writing software or formats or labels about what one is doing. In an article titled Fighting “Tippism,” Stephen Armstrong and Timothy Terrell wrote about how superficial writing “tips” are no substitute for the real work of learning and using the lessons of rhetoric, logic, and cognitive psychology. In the realm of listening, the problems equally difficult if not more so because listening is so difficult to observe and measure. One may have a theory of action that they are in fact a great listener and an active listener. They are totally on board with the value of listening. Internal listening is focused on your own thoughts, worries, and priorities, even as you pretend you’re focusing on the other person. 360 listening. You’re not only listening to what the person is saying, but how they’re saying it — and, even better, what they’re not saying, like when they get energized about certain topics or when they pause and talk around others. A lawyer may believe he is a 360 listener, when in fact he is an obstinately internal listener. This mismatch of belief means the lawyer does not feel any need to work on listening because how can you improve upon something already pretty terrific? And if such a lawyer does read a blog post or attend a training on listening, she might pick up a new term of art for listening, such as “I’m a 360 listener,” while remaining rather poor at it. This obviously connects to the Dunning-Kruger effect of being so bad at something that you don’t even know you’re bad. 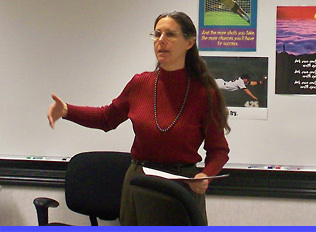 [A] person in persuasion mode tends to act on hidden agendas and strategies; “to minimize self-analysis and to reserve it for private moments when it will not weaken instrumental effectiveness”; and to argue in ways that are subtle but “needlessly stylized and hyperbolic.” Persuasion-mode behavior is profitable in situations where the struggle is for control rather than insight, and where the “self-sealing properties of persuasion mode habits” minimize tentativeness and perplexity. “Persuasion-mode habits predispose lawyers to take evaluative stands automatically” so that they “make statements that, on reflection, they know to be false.” “It causes one to impute rather than explore others’ ends, shut off rather than encourage legitimate objection, . . . and accumulate rather than share decision-making authority. Neumann’s review of Schön’s work ends on an extended exploration of how difficult it is to teach any of this in a formal curriculum—especially the curricula of medical and law school as distinct from the arts and architecture. Teaching reflection and modeling it in experiential classes are crucial. One way to start is simply by sharing with law students and lawyers Schön’s essential and upsetting insight that the way we intuitively explain what we do may not be very accurate. In the far upper right area, where a high skill level meets a high challenge level, you find flow. 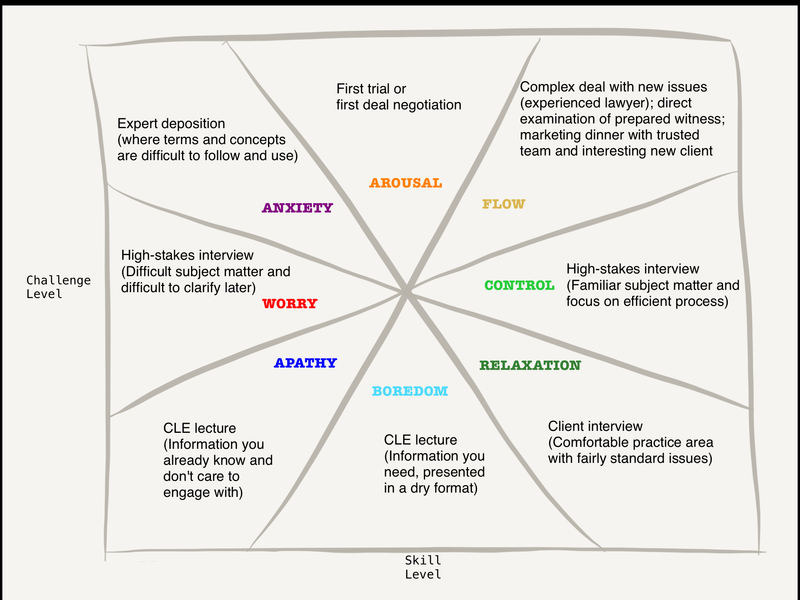 The model below is a variation on Csikszentmihalyi’s general model, tailored for lawyers and legal professionals. The examples here all focus on listening. Please use the comments or social media to suggest other examples and share thoughts on lawyers and flow. What types of listening experiences prompt apathy or boredom? What types of experiences prompt worry or anxiety? And what experiences may lead to flow?